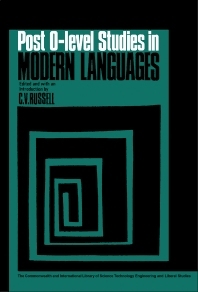 Post-O-level Studies in Modern Languages is a 14-chapter book that begins with an explanation of the changing structure of the sixth-form curriculum and the outlining of a model curriculum based on five areas of experience: communication; sociological and cultural aspects; mathematics; scientific education; and aesthetic experience. The book also discusses the transition from O-level to advanced studies; the study of literature in the A-level curriculum; and the French and literary studies in the sixth-form curriculum. Other chapters tackle the A-level examination syllabus, as well as some problems and suggestions in integrated language studies. Modern languages in industry and commerce, role of the language laboratory in post-O-level studies, and modern language tests in the United States are also explained.